In 1948, a small part of the Woodmont, Connecticut, shoreline affectionately named “Bagel Beach” has long been summer destination for Jewish families. Here, sisters Ada, Vivie, and Bec assemble at their beloved family cottage, with children in tow and weekend-only husbands who arrive each Friday in time for the Sabbath meal. But when a terrible accident occurs on the sisters’ watch, a summer of hope and self-discovery transforms into a lifetime of atonement for members of this close-knit clan. Seen through the eyes of Molly, who was twelve years old when she witnessed the accident, this is the story of loss and its aftermath, of expanding lives painfully collapsed. Can Molly, decades after the event, draw from her aunt Bec’s hard-won wisdom and free herself from the twin burdens of guilt and memory? 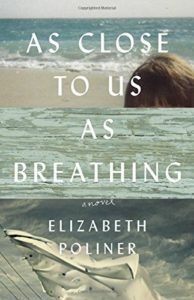 Two things instantly captivated me about this novel: the autonomy afforded to Ada, Vivie, and Bec by inheriting “a room of [their] own” in the form of a summer beach cottage—and yet these female characters live in an era when they must depend on a husband or a son to drive them to it. This paradox is just one of many rich details that brings this specific time and place to life on every page of this beautifully crafted novel. And I was deeply moved by the sense of duty and familial devotion which Poliner conveys with unwavering empathy. Even while we pray for Molly, Bec, Nelson, and the others to shed their burdens of grief and guilt, we also see the abiding satisfactions of faith and family, of belonging to something larger than oneself. From the book’s first page, the beautiful rhythms of the language (it’s no surprise the author is a poet) and the feeling of being wholly transported to a different time, with its very different mores, held me in thrall. Click here to view book club discussion questions.